A Theory of Institutional Advancement? "Institutional advancement" is the euphemism for the collected professions of fundraisers, communicators, and alumni specialists in education. In 2011, an interesting discussion with my colleague Philip Lehman led us to wonder: could there be such a thing as "advancement theory"? If it could exist, how might we characterize it for others to build on? In her book Complexity: A Guided Tour, Melanie Mitchell explores whether her own field, called "complexity science," might benefit from synthesizing its varied threads. Complexity theory has its roots in chaos theory, theoretical physics, and abstract math. So...not much connection to alumni relations or fundraising. However, her exploration of complexity's framework made me ponder a systematic look into advancement. Mitchell asks, is it worth seeking "general principles or a 'unified theory' covering all complex systems?" I wonder, are there structured ideas within advancement rigorous enough to be considered "theories"? If so, should we gather, evaluate, and organize those ideas in relation to each other? Mitchell points out that some sciences are almost ready for unification, others are not. Physics for example is "conceptually way ahead." It is 2,000 years old, and has identified the two kinds of "stuff" that things are made of (energy and matter). Physics has related energy and matter to each other (E=mc2), and has unified three of the supposed four forces of nature. Complexity, on the other hand, hasn't identified anything in its realm comparable to forces or "stuff." There are steps to evolving a theory and using it. First you have to articulate the theories, and account for their conceptual building blocks. Then you can establish the likely relationships among these building blocks, so the model describes the way the discipline behaves in the real world. Then and only then can you start to unify related theories into an overarching description of an entire branch of knowledge (or practice). What is the "stuff" of advancement – its building blocks? The practice of fundraising, communications, and alumni relations? We need specific, detailed descriptions of what our work includes. A first step would be to articulate common advancement principles that apply to all institutions. Further description of these principles would then follow, with practitioners trading, and improving on generalizations that grow from specific instances that represent the underlying principles. This is how highly structured fields prune and shape their theoretical foundations. Can advancement do this? Should we bother? Or is advancement too unstructured, too diverse, and too unscientific to be crafted into a conceptual framework that would be of any use? JT Forbes at Indiana University and other members of the Council of Alumni Association Executives have drafted some definitions and descriptions that get alumni relations started in this direction. Does Alumni Relations Need a Typology? Leave a comment – complex, chaotic, unstructured, or otherwise. Photograph of a complex structure in Singapore by Andy Shaindlin. I recently read Walter Isaacson's biography of Apple co-founder Steve Jobs. It holds many examples of the ways in which Jobs could cut to the heart of a problem or describe an elegant solution in a simple way. One example in particular leapt off the page for me, and I have found that it applies to many things in everyday life – especially in my work. When Apple was developing the iPod, Jobs argued that as many functions as possible should be built into iTunes. In other words, instead of browsing for music, purchasing it, sorting and labeling it, and collecting it into playlists all in your music-playing device (the iPod), you would perform all those functions on your computer – and the music player would be just that – a device for playing music, plain and simple. So by owning the iTunes software and the iPod device, that allowed us to make the computer and the device work together, and it allowed us to put the complexity in the right place. He grabbed a magic marker, padded to a whiteboard, and drew a horizontal and vertical line to make a four-squared chart. "Here's what we need," he continued. Atop the two columns he wrote "Consumer" and "Pro"; he labeled the two rows, "Desktop" and "Portable." Their job, he said, was to make four great products, one for each quadrant. How does this apply to advancement? We have a hard time packaging the programs and services we deliver to alumni. There are so many events, benefits, volunteer roles, and points of contact that we are constantly scheming to combine, describe, and explain them to our audience. Could we simplify our business enough to obtain a Jobsian degree of clarity? It's not as if Apple only had four products, despite the 2x2 matrix. In this example, the "Pro Desktop" quadrant was eventually filled by the Power Macintosh G3. But once the consumer had settled on the G3 as the product of choice, there were a few different configurations (memory, processor, and storage) to choose from. Jobs didn't take away choice entirely – he just put the complexity of choosing in the right place. What would it look like if our 2x2 matrix just had "Students" and "Alumni" at the top, and "Social" and "Professional" down the side? Or maybe, "Engaged" and "Non-engaged" at the top, and rows labeled "Online" and "Offline"? Or it could be 3x3, and the offerings could be labeled however you wish. It doesn't matter what the labels are. The point is to make it easy for individuals to understand what we offer, and to make the decision to buy in. Then we can provide choices that make sense to a subset of our overall audience. Have you done this? How? Did it work? Do Events Have a Social Graph? Below is a network map of a very interesting new book – Too Big to Know [2B2K] by internet scholar David Weinberger. David's book is shown by the magenta node in the center of the network. Directly connected to his book are the books that Amazon mentions that customers also bought [green nodes], in addition to 2B2K. These books are probably more similar than different to 2B2K. The blue nodes are books that are 2 steps away from 2B2K, they are probably more different than 2B2K, but retain similarities also. The arrows show the direction of the majority of also-bought activity. His conclusion? Amazon is building an "Interests & Passions network...under the radar." Events can have a social graph. Is someone who attends a particular event more or less likely to attend certain other events? The answer could improve our target marketing for events. Volunteerism can have a social graph. Is someone who volunteers for a specific role more or less likely to fulfill another, specific role? The answer could improve volunteer recruitment. And directionality matters here too. For example, arrows would show which volunteer roles lead to future activities. This is hardly a new idea. Overlay behavior onto a social graph and you're creating an interest graph. That's how several popular online services work, in a general way: Zappos, Netflix, and of course Amazon. But these sites mostly aggregate past users' behaviors to influence the next user's behavior, without those users being connected otherwise. A true "interest graph"–based system would interpret your behavior to help organizations understand why you attended that additional event, or how you felt about your volunteer experience. Intrigued by this idea? Then see this article by Derrick Harris: The personalized web is just an interest graph away. Do events, volunteer roles, and other engagement tools have social graphs? If they do, should we be capturing and analyzing them? Why – or why not? 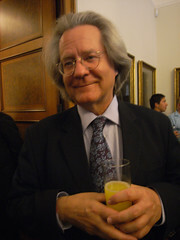 The English philosopher A.C. Grayling seems to produce a book or two every year, about things I can't comprehend. For example, is philosophical realism more epistemological than metaphysical, as a construct for understanding the relationship between one's mind and the world? Uh, let me get back to you on that, Dr. Grayling. But every once in a while, Grayling produces something that many people can understand. In his 2010 book, Ideas That Matter: The Concepts That Shape the 21st Century, Grayling has compiled "a personal dictionary of ideas" that he finds worth examining, and suggests themes that will dominate political, economic and intellectual debate in the coming decades. Last year, The American Scholar featured a dozen critical themes proposed by Grayling (not all of which are in his book), and among them I found five themes with direct, and potentially monumental, implications for higher education. Note: One of Grayling's constructs is education itself, which he covers in about nine pages, but it seemed a bit too meta to state here that education has long term implications for education. I've listed the other five below with my own brief comment on their relevance. This is obviously a too-brief treatment of critical topics, but I'm curious how others see these topics in the context of higher education in the coming decades. Grayling calls the web "the largest graffiti-scrawled toilet wall in the universe," but its potential to transform education is vast. In fact, it has already done so. One remarkable thing about digital and electronic developments is that they are so new, in historical terms. We're at the absolute beginning of digital technology's influence over education (and everything else). Not all technical achievements are desirable, obviously, but they can open the door to more effective ways of doing things we've long tried to do (such as educating each other and ourselves). Grayling's prescription for dealing with China's lack of democratic instruments and questionable human rights record is weak: "the rest of the world should continue encouraging it to practice good statehood." OK, sure. But consider China's economic and population growth, the public Westernization of certain aspects of its society, and its increasing (but so far, tenuous) links with Western institutions. These mean that many or most global education brands will try to place China securely in the forefront of their international strategy. Grayling focuses on the social outcomes of large-scale African and Middle Eastern migration to Europe. The international flow of students is recasting institutional definitions of what it means to be a "global" university. In fact, nobody yet knows what it means, and the moment that someone figures it out, the definition will change. Either way, increased international student mobility has implications for marketing and recruiting, fundraising and alumni relations, and competition across national borders and regions. Grayling points out that print news media are "struggling to survive" as the written word shifts to digital form. He doesn't say why we need printed media – did people say that the horse-drawn wagon was "struggling to survive" 90 years ago? Or was it obviously obsolete? Either way, digital storage and transmission of information (and its accessibility and portability) are wreaking havoc on traditional models of educational publishing and, yes, on retailing too. Campus bookstores house fewer and fewer printed books, and more and more gadgets for reading the books in their new incarnation: the digital volume. On the heels of describing the downfall of printed news, Grayling points out that "the fashion for all things retro is already growing, and that is not a bad trend." Is "not bad" the same thing as "good"? Grayling doesn't say. But one thing seems likely: the past will be romanticized by anyone suffering from "retromania," just as people seem to think that "information overload" is a product of the digital age (it isn't). Who knows, maybe printed books will come back into style briefly, as an affectation of youth – like the cigar, the martini, the ironic fedora, and swing dancing. Are Grayling's trends important to education? What aspects of their importance have I neglected?